This isn't just a book you read--it's a book you experience together. Its interactive style allows you and your future spouse to explore its biblically-based counsel and challenging questions together or with a pastor. 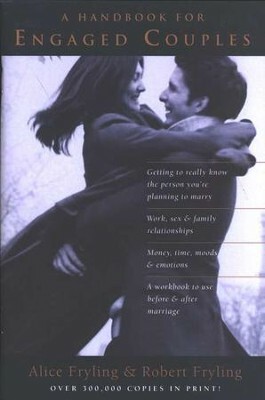 And with three chapters tailored specifically to your first few months together, you can even use A Handbook for Engaged Couples after the wedding. Set aside time now to develop a marriage that starts well and grows to lasting maturity. Alice Frying is a spiritual director and the author of nine books, including . She has been giving Enneagram workshops for fifteen years, teaching participants how to use the Enneagram to know God and themselves more deeply. She and her husband have two married daughters and four grandchildren. Robert A. (Bob) Fryling is publisher of InterVarsity Press (Westmont, Illinois) and Vice President of InterVarsity Christian Fellowship (Madison, Wisconsin). He writes, speaks and teaches in the areas of spiritual formation, leadership, Christian faith and culture. He lives in Illinois with his wife, Alice, an author and spiritual director. Together they have co-authored three books. I'm the author/artist and I want to review A Handbook for Engaged Couples.